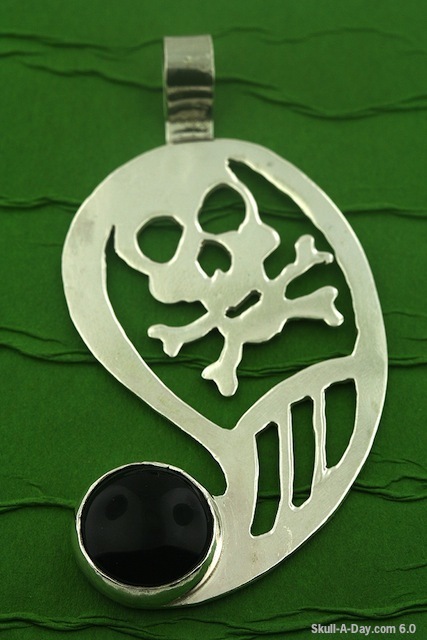 Artist Kimberley Grasing of LexieJewel in New York designed and created this “Poison Paisley Pendent” using sterling silver and black onyx. Some cultures will use talisman to ward off a number of things, I can not help but think of this as a sort of talisman to protect you. In jumping around I found that Onyx is sometime associated with assisting you in changing bad habits. 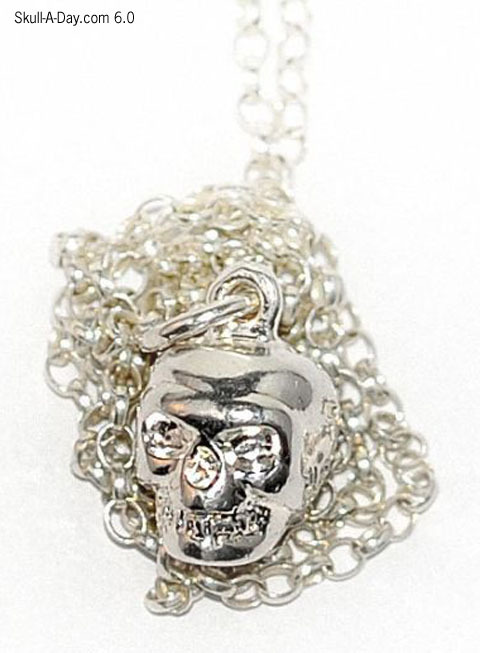 That thought gives this pendent a whole new meaning as the skull could be representative of those bad habits being released from the stone. Thank you for sharing this work with us and much luck to you in your quest to change any bad habits you may have. 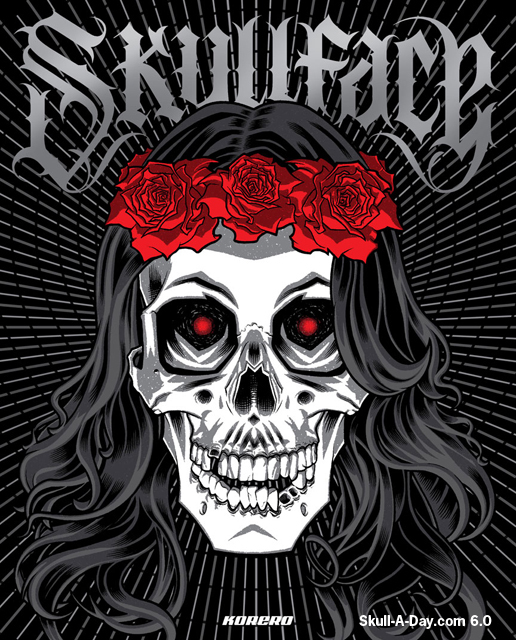 Don't forget that you have until Midnight TONIGHT August 30th to be entered to win this amazing book, "Skullface", from Yak El-Droubie and Korero Books. 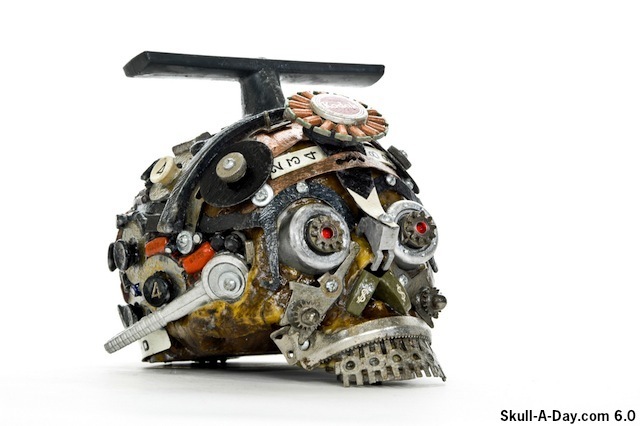 I would dare say that you might hate yourself if you missed the chance to own this collection of classical craniums. Follow the link to the original post here or click on the ad at the top of the sidebar. Of course you don't have to wait to win a copy, visit the site here to purchase one or more (Christmas is coming) and check out all of the awesome art books from Korero. Thanks again for the great prize, Yak! Teresa Houghmaster of Little Dead Things, in Memphis TN creates these wax skull candles, She creates them using some techniques learned while making zombie lawn art with friends, and some learned after she started concentrating on making only the candles. This is the time of year where I see lots of skull candles, for Halloween. They are normally mass made, and lacking the special details that hand made candles offer. 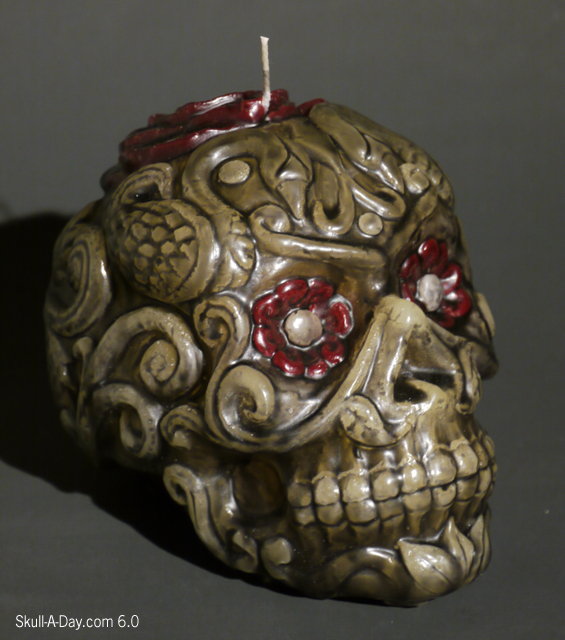 This highly detailed skull candle shows a great level of craftsmanship from years of study. Candles like this one are too beautiful to burn. Instead, I consider them wax sculptures. You can see more of Teresa's work on her Facebook and in her Etsy shop. 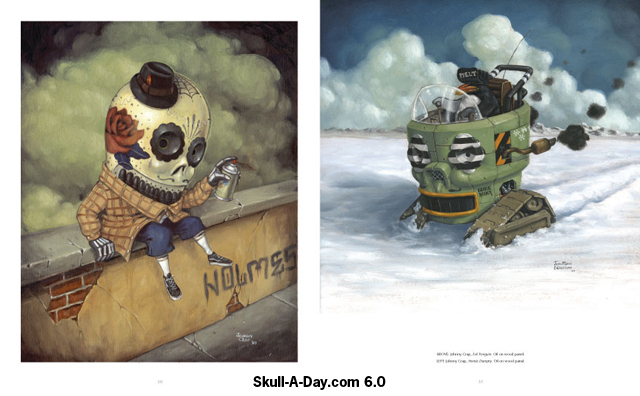 Today’s Skulls are a pair of painting. The first is from Mish Tiemann of Illinois who we featured once before for another paint job HERE. 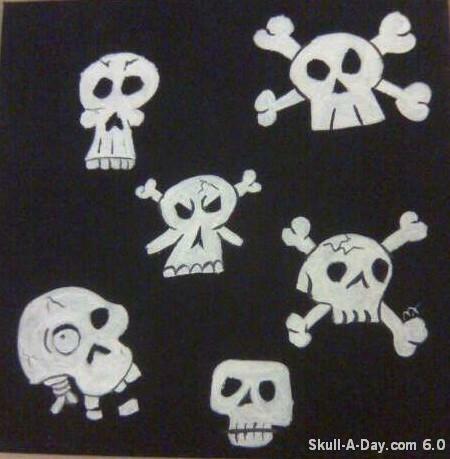 The next is from Mark Taylor who completed this painting of white skulls on black canvas all painted in acrylic. Canvas is one of those wonderful material that can be used for a numerous amount of things: from clothes to shoes and from tents to sails there is a wonderful possibility out there of using the painting medium for purposes that are only is limited by the imagination. Thank you both for sharing your work with us you have actually inspired me to go looking for my old pair of canvas sneakers to create with. 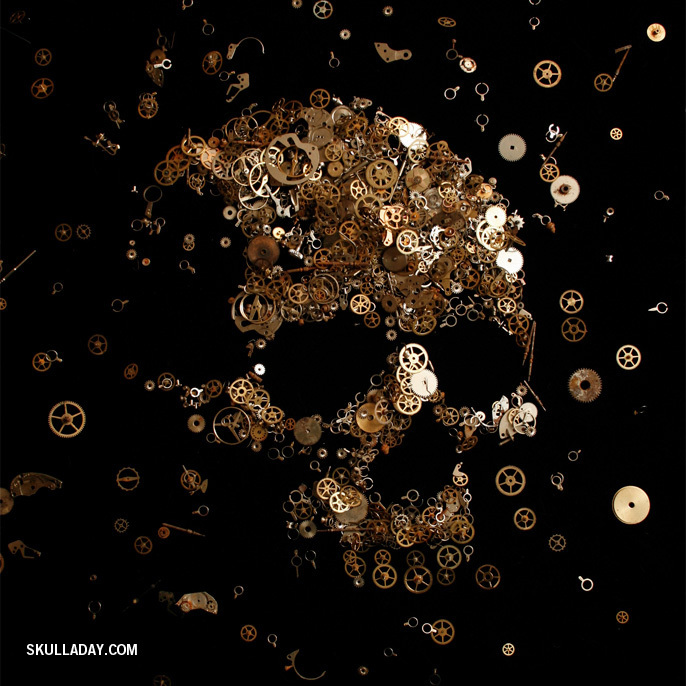 Made entirely with vintage watch gears, the skull itself is actually only about 5 x 6 in (12.7 x 15.24 cm). From the left coast of Canada, Chilliwack, BC to be more specific, Ani Harper sent us the following, "I just found you're great skull site. 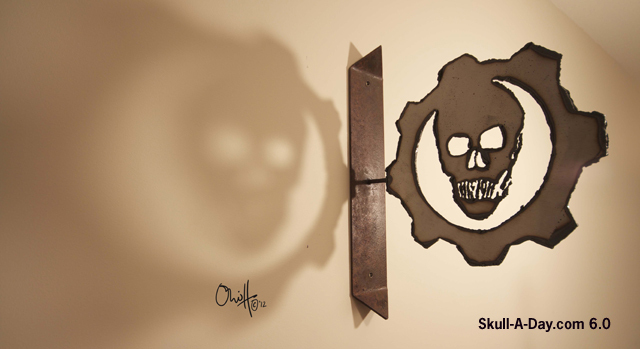 Thought you might enjoy my plasma cut skulls. 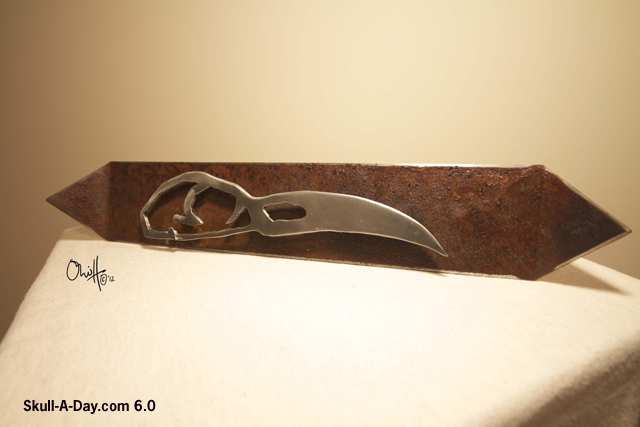 They are all free hand cut out of 20 gauge steel metal, reverse welded onto a rusty plate and clear coated." That's some wicked work to be done free hand with such a powerful tool. Plus, I can't believe that we still have such great artists just now finding our site. I guess it's a good way to keep the great skull art flowing. Thanks for sharing, Ani! 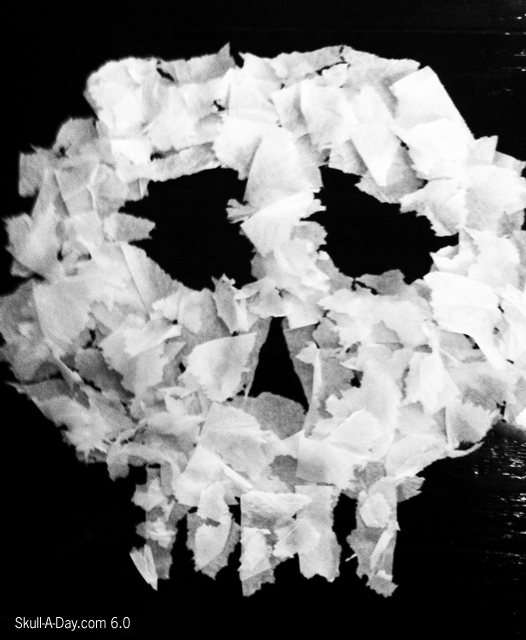 Craig Perra from Rocklin, CA, made a skull with little pieces of napkins. Sometimes playing with ordinary objects (in this case a napkin) can lead to extraordinary results. I love the lightness of this piece, cause by the ply of the napkin being separated. The starkness of the white paper against the black background helps accent the soft details. Pieces like this make me want to play with my normal materials, in a different way. Don't forget that you have until Midnight EST on August 30th to be entered to win this amazing book, "Skullface", from Yak El-Droubie and Korero Books. It would be an awful shame if you missed a chance to own this collection of classical craniums. Follow the link to the original post here or click on the ad at the top of the sidebar. This week's set of simulacra are leaving their mark on this world. Some a little more permanently than others. 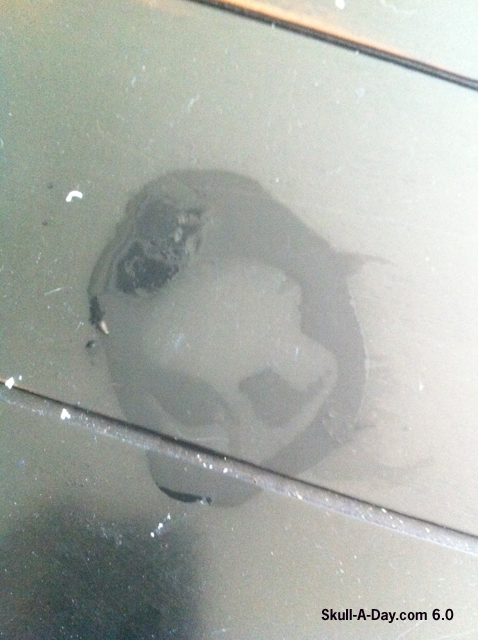 This skull stain showed up on my own son's night stand after he left some sill putty sitting in the same place a for a couple of days. 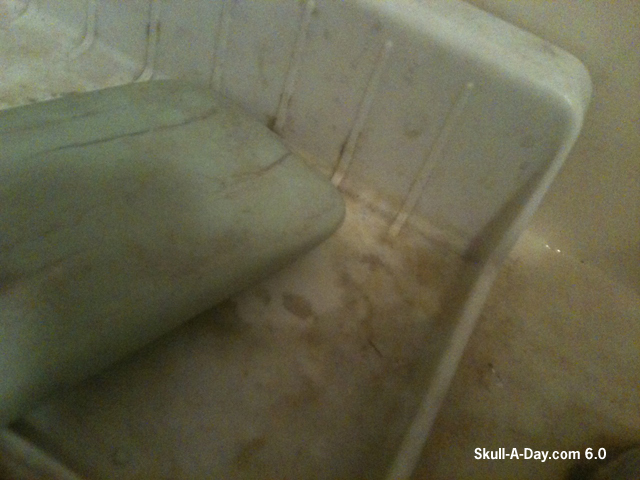 And Dani Adams discovered this condensation skull underneath a glass of water in Denver, CO. 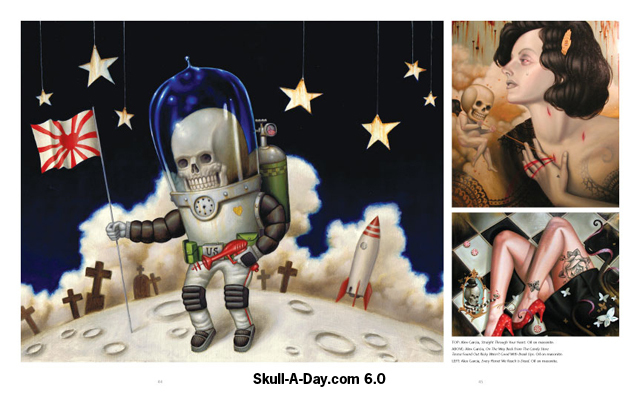 Some skulls are there to be noticed for a long time, some are fleeting moments caught by the watchful eye. 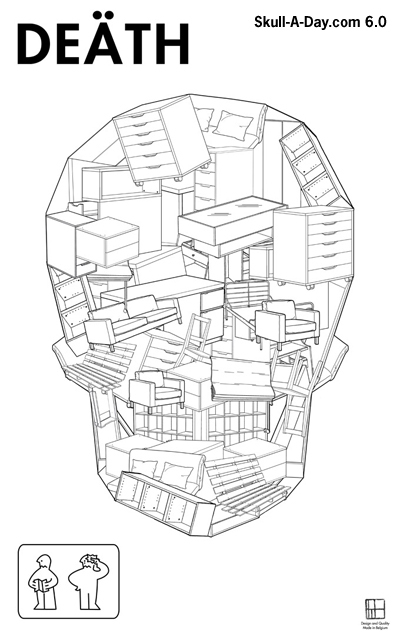 What kind of simulacra can you find? Be sure to submit them so we can display all of the great hidden skulls out there. Thanks, Dani! Just wanted to share a couple more tattoos featuring my work! Do you have a Skull-A-Day inspired tattoo? Please drop us a line and share it! If you do you'll be joining the elite ranks of Skull-A-Day tattooed including our editor Abby, who has my Quoth The Skull on her arm; Thomas who has my Skulledelic on his arm; Deacon who got my Ornamental skull on his back; Denis who got a skull I drew for him when I signed his copy of my book Skulls; Kevin, GlobGlob & Drew who used the Skullphabet for their tattoos; Katrina who had a tattoo designed for her by Skull-A-Day fans; Danny who got the Rorschach Skull; Tammie who got my Acorn Skull; and of course Skull-A-Day editor Tatman and myself! If you've been reading Skull-A-Day for any length of time then you are sure to have been witness to the the bright and bold world of Dan Springer of Skulluxe fame. Now Dan's back with so much new stuff that A Super Skull Saturday was in order. 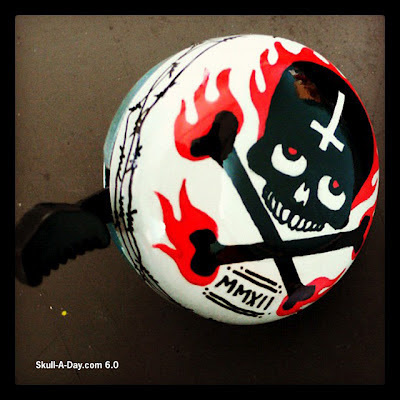 Most of Dan's works are painted on wooden panels, but I see a new trend has caught his eye with the painted bike bells. I'm sensing a pattern of awesomeness appearing over at Skulluxe. 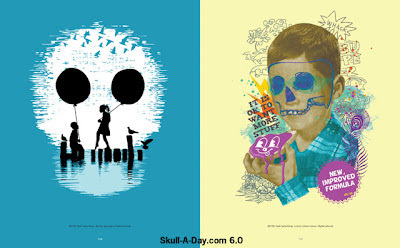 Perhaps these will also catch the eye of a fellow skull and bike lover over at his site (hint, hint, Paul). 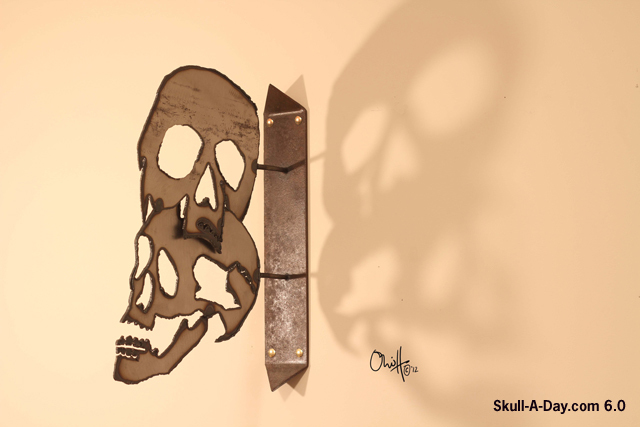 Be sure you check out the rest of Dan's terrific works of more than just skulls. 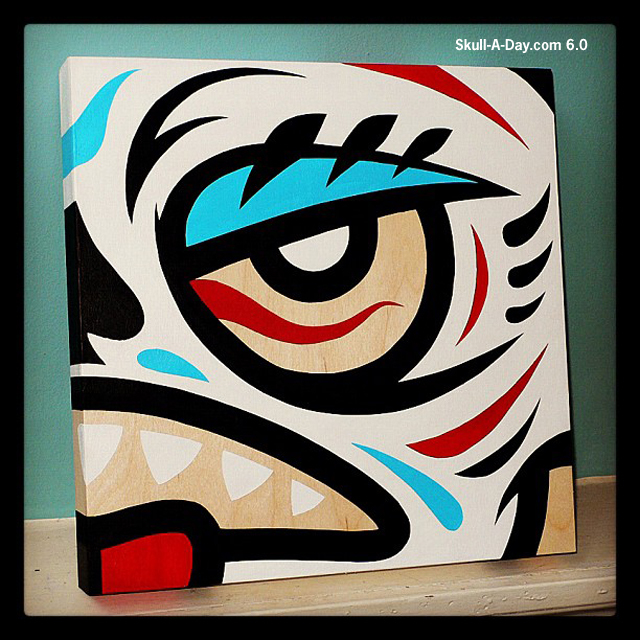 He's got a unique flair that really pops and brings vibrancy to the mundane woodgrains he uses for a canvas. 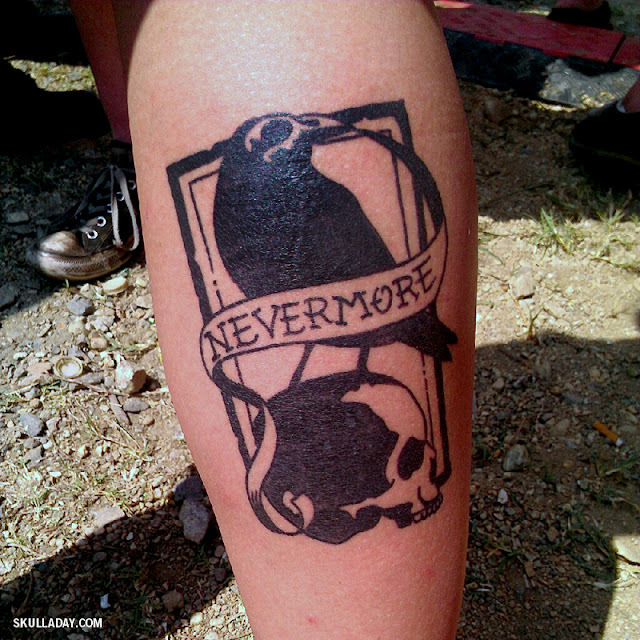 Thanks again for the incredible submissions, Dan! 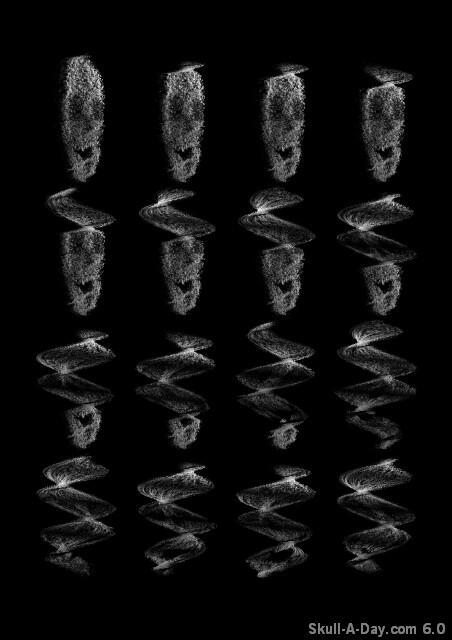 I find the new age of digital arts to be a fascinating wonder. Its magic however also frightens me as I fear that its future place may not be to enhance the existing arts but rather to replace them. With that it is hard not to see with your first image a connection to the art of stained glass or mosaics with its combination of varying individual colored pieces to create a larger deeper image. Perhaps in this case the digital arts could enhance the art form as it could take away some of the guess work on what truly works best together. Thank you for discovering our site and for jumping in head first by sharing your creative coding with us. 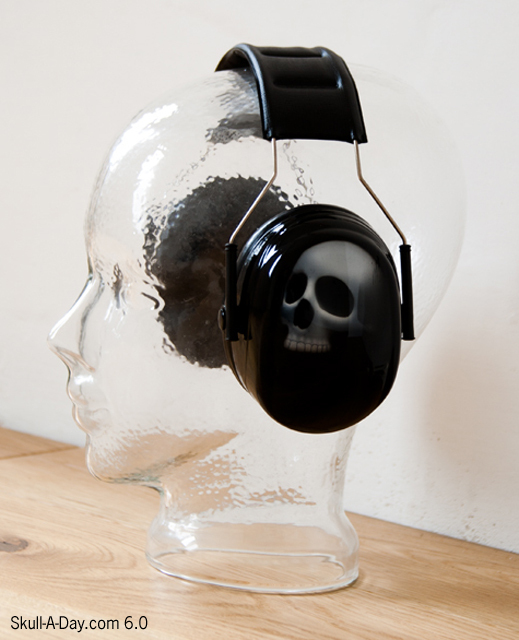 Klaus of Artwork 79 airbrushed skull artwork for the upcoming Deela album "Rumbullion", and on ear protection. Music, like art, can speak to your soul. They are a natural pair, like two people forever entwined. 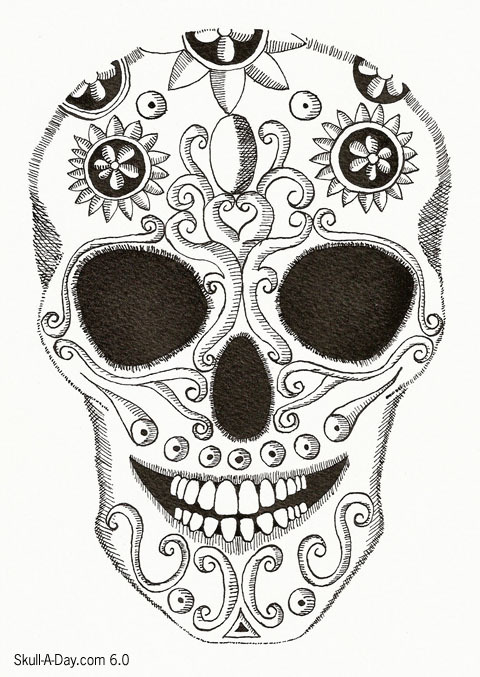 The album cover pulls inspiration from Dia de los Muertos and Mexican music culture. The bright colors and design draws me in, which is exactly what an album cover should do. 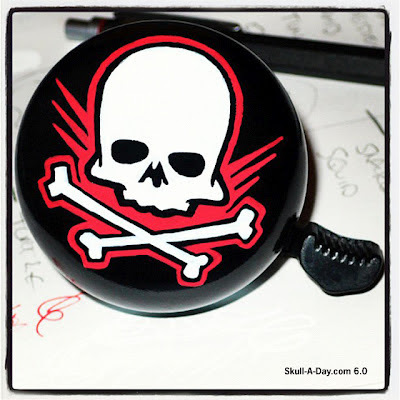 The ear protectors' design reminds me that protecting my ears is just as important as protecting my skull. To me, they resemble headphones. Perhaps if they were, the melody would be as upbeat and bright as Deela's music. "Skullface" is a beautiful hard cover book that measures almost 8 1/2" x 10 1/2" (215mm x 266mm). 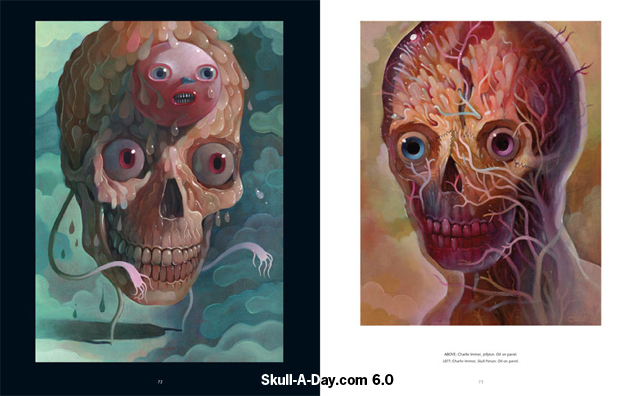 That means that each piece of skull art is in amazing color, or black and gray, and large enough to genuinely appreciate. The winner of this contest will receive one of the books for their very own! To be entered in this free contest you are being asked to leave a comment stating your favorite skull artist. There are so many out there these days that we should get a heaping helping of creativity to check out. 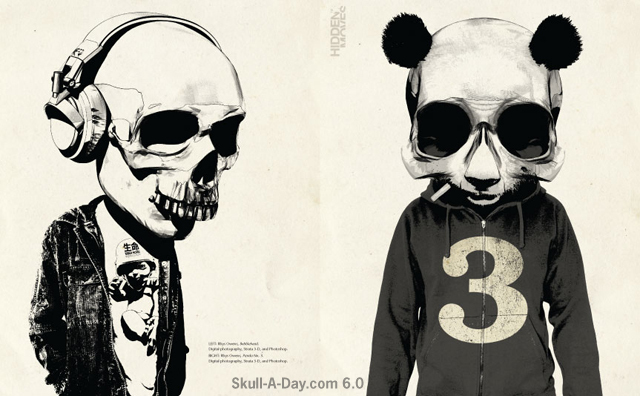 Naming one of the Skull-A-Day editors won't increase your chances of winning, but we always appreciate the kind words. You have until Midnight Eastern time on August 30th to be entered. Note: Yak has agreed to ship to our winner anywhere in the world so here's a global good luck to you all. Of course you don't have to wait until the end of our contest to ensure that you're a winner. You can purchase your own copy(or more for friends) here. Be sure to check out all of the interesting art books they have to offer at Korero Books. GOOD LUCK!!! There is something philosophical in thinking about this work. The act of taking something that has reached its end and using it to create new art that is dedicated to the symbolic image of the end. It's quite a powerful natural experience that one sees repeated in the processes that decompose our world. 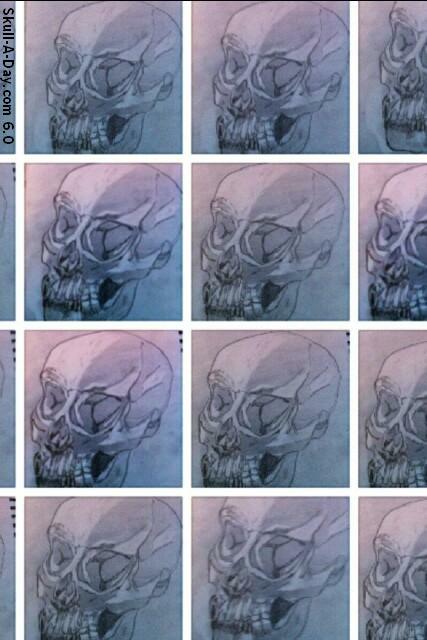 Thank you for sharing with us the beginnings of this new amazing series of skulls. Belgium's Philippe Debongnie, previously featured here, returns with some awesome new collages. These are simply wonderful. Fish are friends, not food (unless properly prepared with some lemon butter). We all need to be more earth aware, especially when it comes to our oceans and earthly supply of water. The second piece looks like an Ikea nightmare. YIKES! 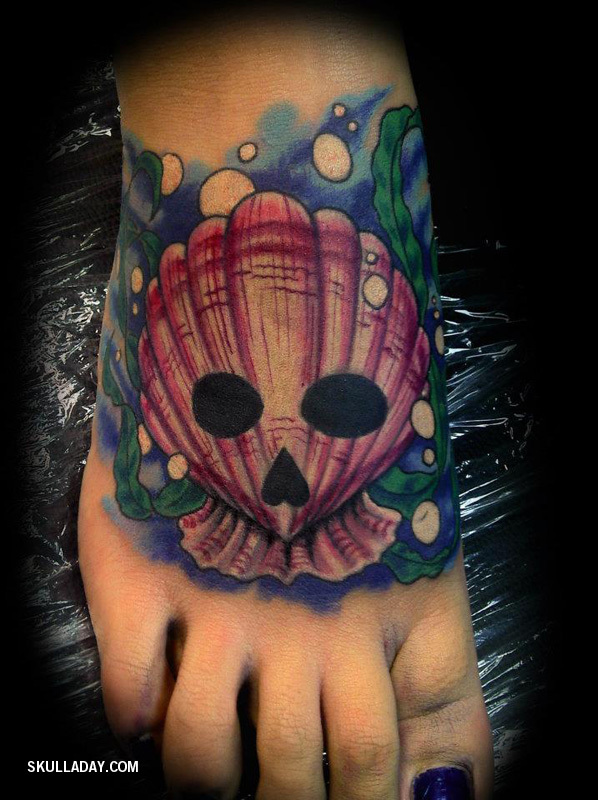 Thanks for sharing again, Phillipe! 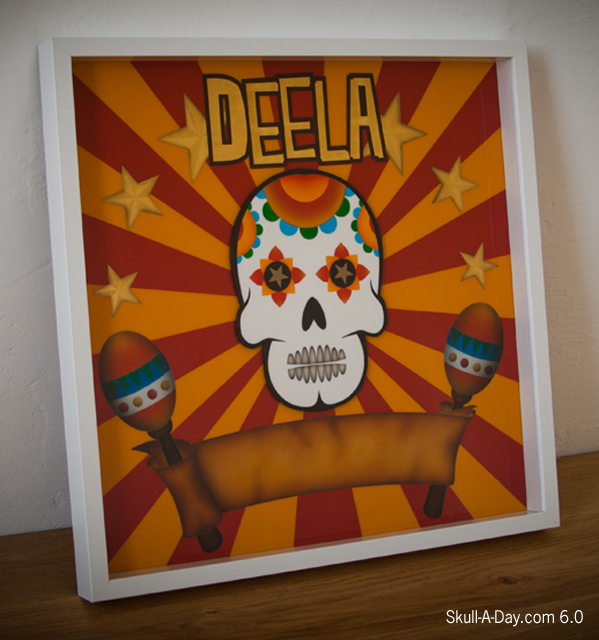 Lisa Hawson, from Surrey in the UK, created this Dia de los Muertos inspired skull. Dia de los Muertos is only a few more weeks away. This festive drawing reminds me of the sweet decorative sugar skulls made for the two day celebration. Though the festival's roots are in Mexico, many people in other countries celebrate it as well. I'm not of Mexican decent, but there is something about honoring my ancestors and heritage that is alluring. 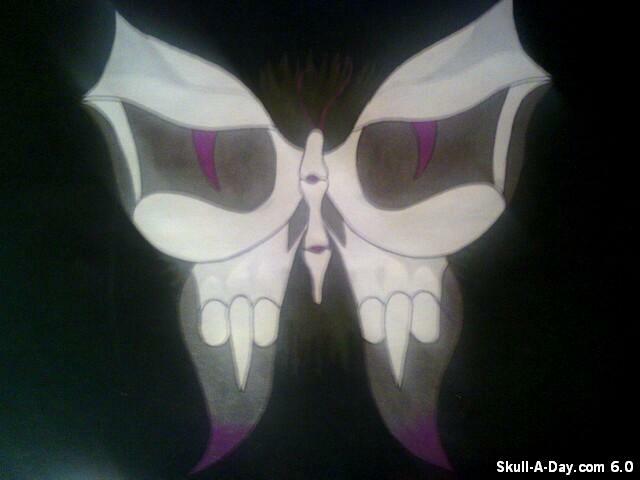 I plan on celebrating with my family, and perhaps drawing a few skulls myself. For more of Lisa's work, check out her blog and website. This week's simulacra are a couple of free loading loiterers who got caught by our ever alert skull hunters. 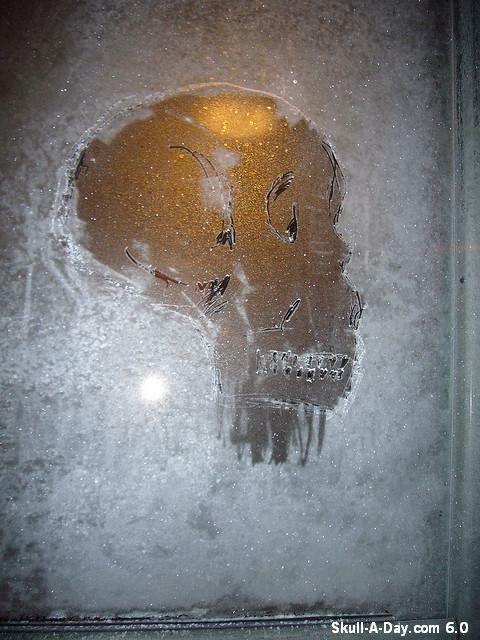 ...and Marty Busch found this stained skull hanging out on a roof hatch at the mall in West Dundee, IL. He, like I'm sure many more of us, instantly saw the Misfits skull. 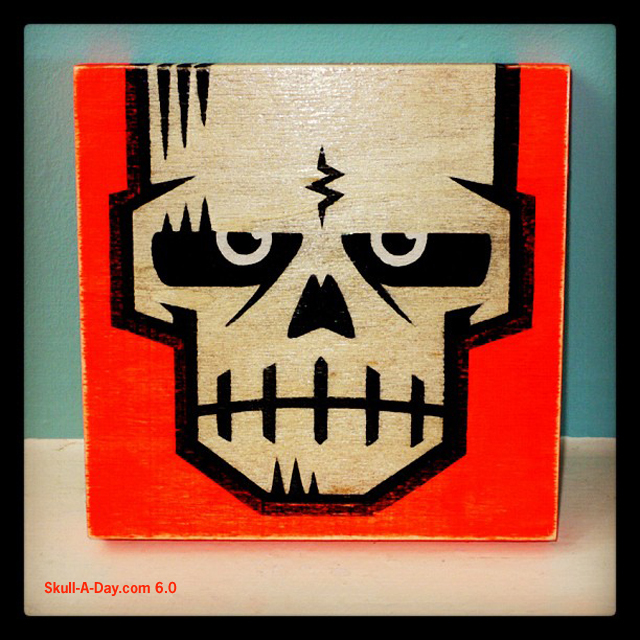 We don't issue fines or put up "No Loitering" signs around here on Skull-A-Day. 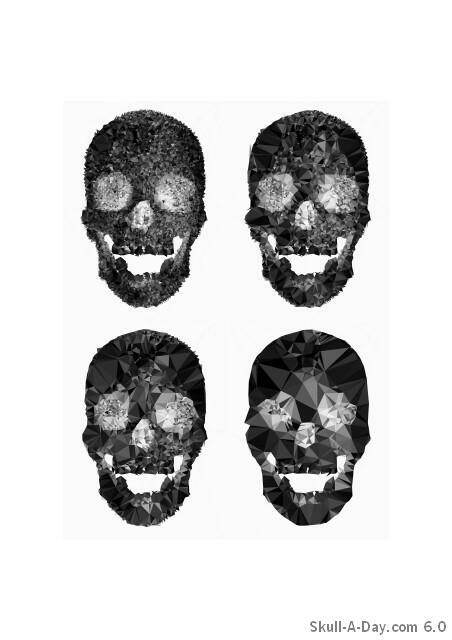 We welcome all of the hidden skulls a chance to show themselves and to be themselves. That's what this sharing thing is all about. Thanks, Shawn and Marty! 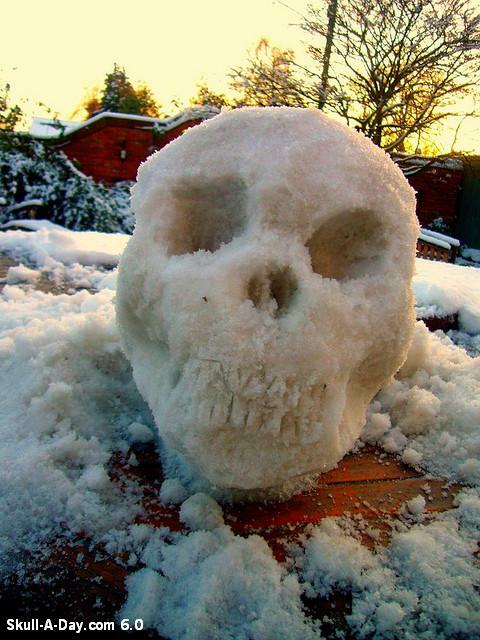 Nick Newton is from Calgary, Canada and he digs skulls AND our site. 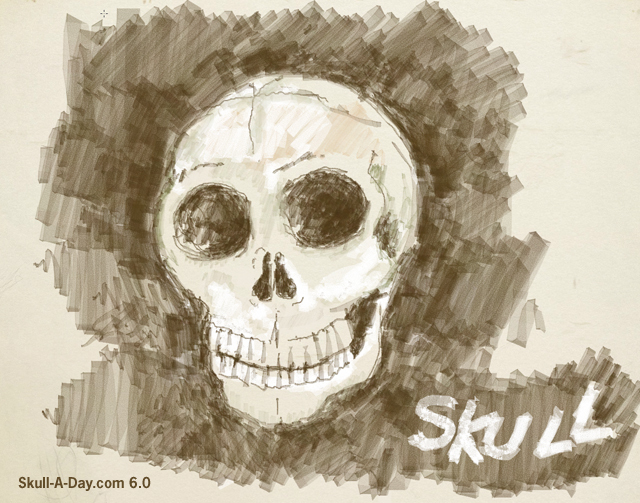 He's presented us with this smiley skull sketch that he created using odosketch. 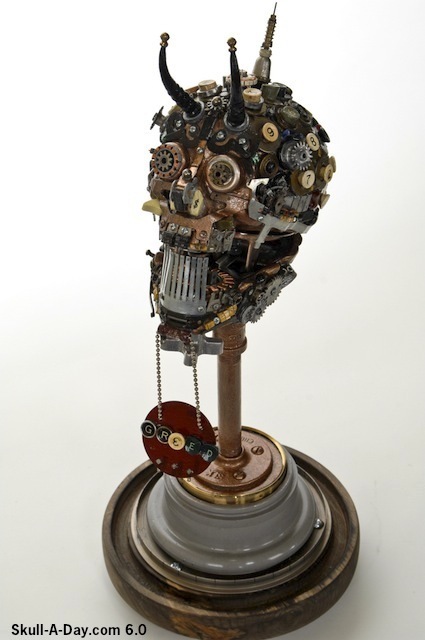 I dig the way you kept us in mind once you completed this cranial creation. Plus, the odosketch site is a pretty nifty place for spreading creativity. Thanks for sharing both of them with us, Nick! Design Student Chessie Rosier from the UK showed off some of the skulls that she likes to create. This is a refreshing collection of works to take us away from the “Dog Days of Summer”. While these works are just memories of a past season, they also serve as hope looking towards the next change in season as the cycle of dormant and rebirth continues. Thank you for sharing some of your work with us here as well as the other great work on your facebook page. Thank you for participating. This contest is now closed. Don't forget, you have until Midnight TONIGHT, August 16th to enter our current giveaway for one "Vince" skull from Cardboard Safari, to one lucky winner! If you haven't already entered, visit the original contest announcement post here, or click on the top sidebar ad to be taken to the post. We all have our own version of Vince, which is more amazing in person! I'm excited to put mine together. I'm considering saving it as an activity to celebrate the 1st day of school, since my daughter loves puzzles! Of course you don't need to wait till the end of the contest to get your own Cardboard Safari creation. 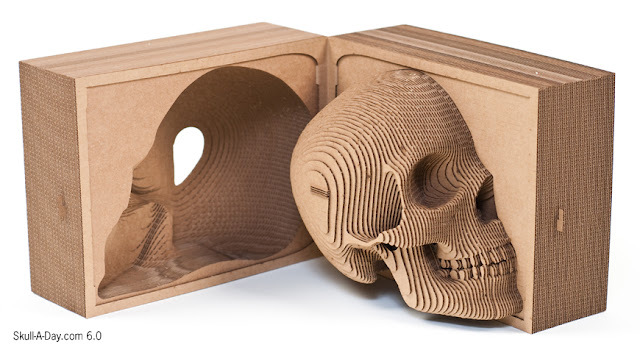 Visit their site to purchase one or more of their "Vince" Skulls available in two colors, or any of their wonderful recycled cardboard designs! 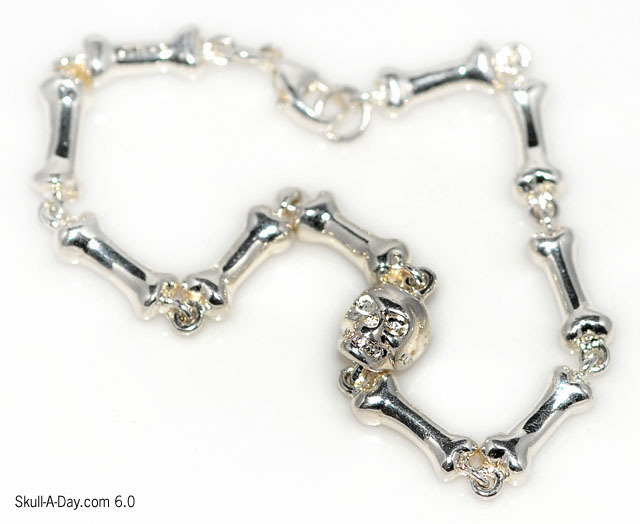 Janice Byrne is obsessed with skulls. She owns a jewelry company, Jlb Jewellery, where she occasionally makes some skull and bones pieces. I'm always attracted to highly detailed and delicate unusual jewelry, so when I saw these two lovely pieces, I was drawn to them. These, like many of Janice's pieces, are shiny and the inner magpie in me, loves shiny! These piece are very wearable from a day at the office, to a night out, or a weekend trip. For more of Janice's jewelry work, check out her website and Facebook. 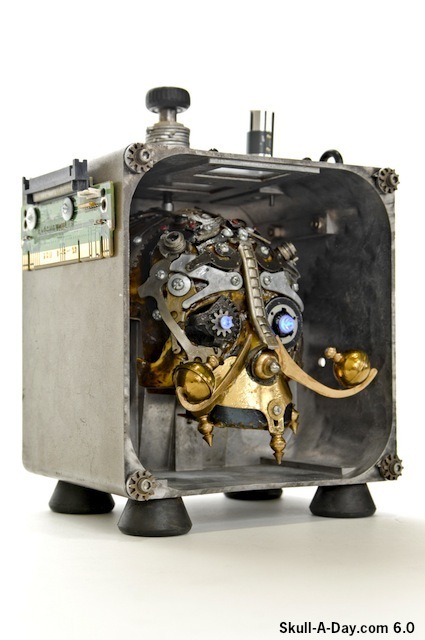 Robert Bianco mentions that he creates art as part of his “daily therapy” and included a pair of pieces for us. We all deal with the pressures of daily life in different ways. I myself find the act of creation to be much more fulfilling than other methods. However, this isn’t about me it about you and with that I say- Thank you for submitting some of your daily creations for us to share. 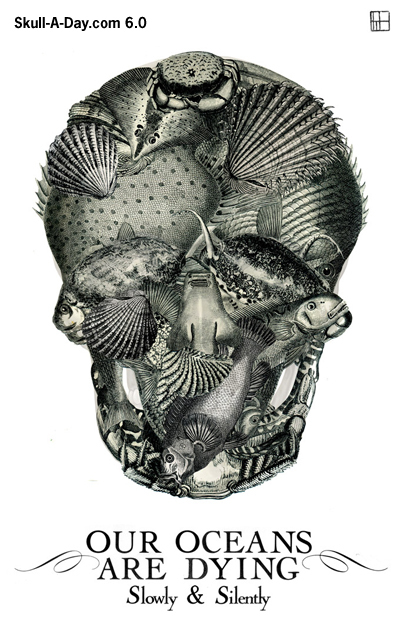 Clare Twomey of North Lismore, Australia is an artist who has been using the skull as inspiration for a long time. At the moment she's part of a protest group fighting Coal Seam Gas mining. They're currently using this image on badges, later she'll finish it as a coat of arms for t-shirts and jackets. The 'Knitting Nannas Against Gas' "peacefully and productively protest against the destruction of our land and water by exploration and mining of Coal Seam Gas and other nonrenewable energy." 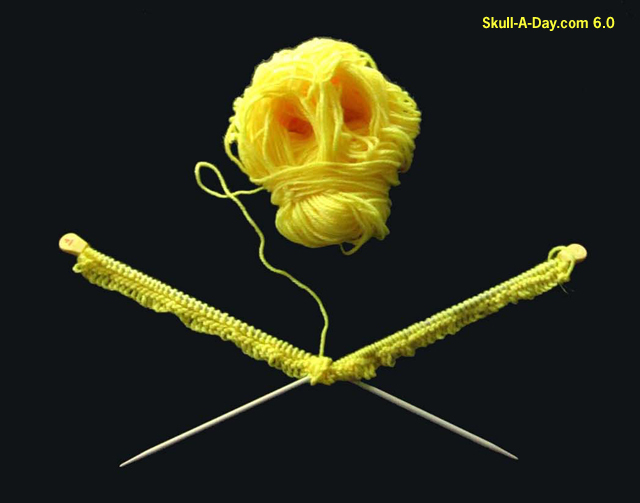 Knitting with a cause and creative revolution. Who knew that yarn could carry such weight? Thanks for sharing, Clare! 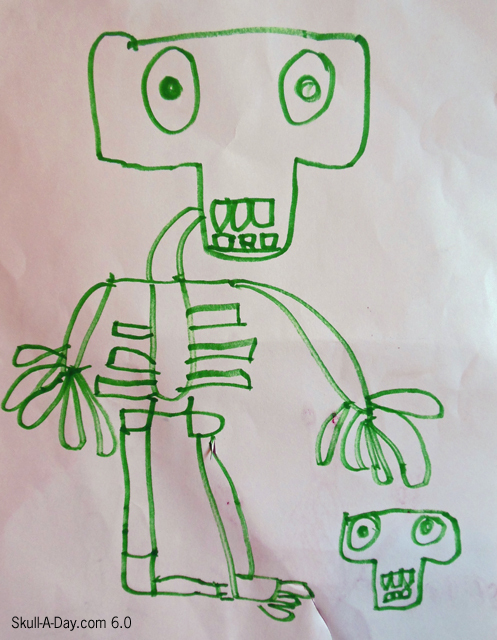 These two drawings were done by Caleb Schumm who is 6 years old. As someone with a young child, I always enjoy the submissions we get from children. 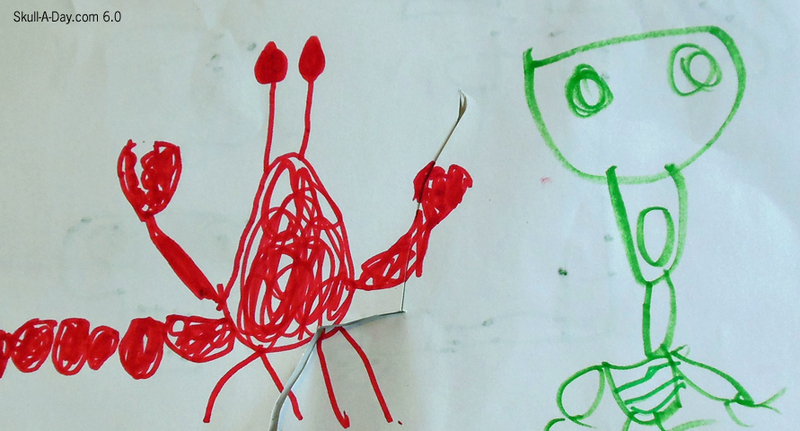 These two drawings are very cute and creative. I love all the little details, which shows that Caleb is a good observer. Looks like this skeleton has some fun adventures and probably plenty of graveyard stories to share. [BONUS] The Gift Of Skulls Extreme!